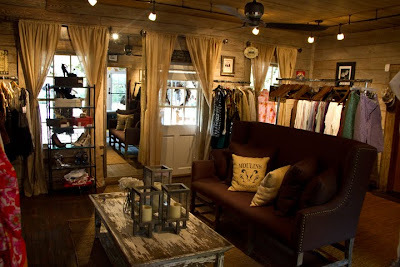 Estella Boutique, the earthy, feminine shop of Tameka Raymond is like an oasis in the middle of Roswell, Ga. I feel as if I've happened upon a sweet little secret that on one hand, I want to keep tucked away; my own retail sanctuary. And on the other, can't wait to share with every fashion-lover in my circle. They will certainly be indebted to me for this find. (Thanks Kam!) If you want downtime cool, she has it. Dinner fabulous, she has it. Career sophisticated, she has that too. And the bonus: You'll have been styled by Ms. Raymond herself. Well, not exactly. But, it will feel like you have been -- as every piece is handpicked by the veteran stylist herself. Aside from combing the racks of Estella, I sat down with Tameka for a chat about her newest venture. It was my maternal grandmother's name, and she passed away in December. In Persian, it means star, which I thought was so pretty. So, it's an ode to her. This area of shops is one of the city's best kept secrets. How did you decide on Canton Street as the home for your boutique? Besides it's proximity to my home, I just love the feeling of the street. My paternal grandmother lived in an area of California called Clear Lake, and it was very similar this neighborhood. There's something so endearing and sweet ... it feels like Pleasantville. It's also very historic and full of character. This building is actually the oldest in Roswell. How would you describe your selection? Some of it is based on my personal taste and style. Then, I also thought about my demographic -- teen moms, stay-at-home moms and retired women. It's not a boutique of trendy things. I filled it with classic pieces that could go with anything. What is your favorite item in the store? A striped linen blazer by Olive and Olivia. I live for that blazer. If you could live in one wardrobe item, what would it be? I know you just asked for one, but definitely a pair of jeans and an Alexander Wang tank. I'm a huge fan of Alexander Wang. I feel like from what I've seen of your personal style, professional work and how you've stocked your store, I'd love to see an actual line from you. Is that ever in your plans? A potential clothing line has been in the works for the past five years. It's called Hides & Dungarees. Sometimes I over think it and I am always critiquing it because it's like a dream ... a baby of mine. I haven't brought it out because I get cold feet. I want it to be right. I've also been busy doing other things like raising my boys and working with my foundation, the Lost Ones. I spend half of the year planning for our events with the girls. But when I do debut my line, it will be here. I would turn the whole back room into a Hides & Dungarees room. It sounds like she is very calculated in her business ventures. I can definitely appreciate that and take inspiration from it. Can't wait to visit her store. Thanks for the shedding light on this great find! Great article Katrice! It's funny one of the favorite pieces in the store is the sriped linen blazer which is something I've been searching for for months. I recently found one similiar to this(all black with striped jean and white lined inside, 3/4 length, and folded at the elbows) at Target and I love it. $20!!! Tameka's shop seems so relaxing, a very personable feel to it. I would love to visit her store. I love this post best of all. It is promoting small business on a large scale based on the quality that I see in the photos. 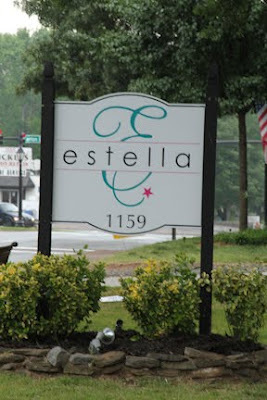 The interview shed light on the muse of her creating of Estella which personalizes you with the owner and her product. GO KATRICE! Estella is definitely my fav find of the summer. 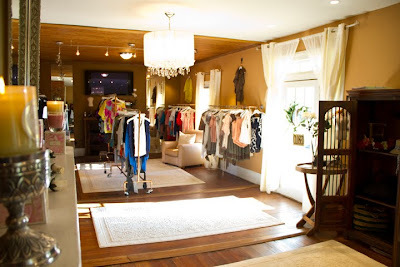 The boutique has a wonderful feel and the clothes are so lovely that I want one of everything. Definitely planning to visit ~ thanks (again :-) )! I really enjoyed this posting. You are making me want to move to Georgia, Katrice! Check out this new store in buckhead called 5 Continents..Jewelry, clothing, art from around the world! I love the Jewelry, I bought the Turquoise Jewelry!